Doesn’t really look like the logo, does it? ‘Alouette’ is the French word for ‘lark’, originally referring to one of the many Eurasian larks of Alaudidae, but it can also mean Horned Lark. Ergo the logo looks kind of like a Horned Lark. Nice call, Robert. The bird definitely looks more like a Horned Lark. Linnaeus simply translated Catesby’s “Large Lark” into Alauda magna when he gave it its first binomial; Vieillot recognized the bird as in fact a blackbird-type and created the genus Sturnella (“little starling”) in 1816. I’m guessing Trestman knows all this already. 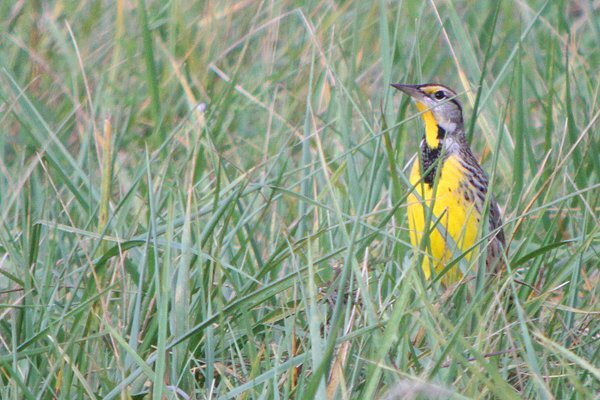 Might be a francomanitoban thing, but my francophone french teacher back home was very specific when he translated Alouette for us back in High school, telling us it was a Meadowlark. I still want to know how in the heck you pluck a beak? 1) What rough-and-tumble football opponents would be quaking in their Adidas about having to play the Larks? 2) South Park has apparently failed me, since apparently there are some CFL teams not named the Rough Riders. 3) Wish I had a memory scrub device, like in Men in Black, since I’m now traumatized by what the “Alouette” song is really about. Could be worse, though … at least I don’t speak French. What is a Black Hawk? Where Are You Birding This Third Weekend of May 2015?